VANCOUVER, British Columbia, Dec. 27, 2018 (GLOBE NEWSWIRE) -- MGX Minerals Inc. (“MGX” or the “Company”) (CSE: XMG / FKT: 1MG / OTCQB: MGXMF) is pleased to provide an update for its REN Niobium-Tantalum-Titanium-REE Mineral Property (“Ren” or the “Property”) located in the northern Monashee Mountains of southeastern British Columbia. The Company has now received assay results from diamond drilling as well as field reconnaissance results from a regional geochemical sampling program completed at REN. *: Geochemical analysis of Total Rare Earth Oxides("TREO") include: La2O3, Ce2O3, Pr2O3, Nd2O3, Sm2O3, Eu2O3, Gd2O3, Tb2O3, Dy2O3,Ho2O3, Er2O3, Tm2O3, Yb2O3, Lu2O3, and Y2O3 (NOTE: Pm & Sc not analyzed). Neodymium Oxide is defined as Nd2O3 and expressed as a percent out of the TREO content. The four most abundant rare earth oxides that make up the TREO reported above are Cerium (Ce2O3), Lanthanum (La2O3), Neodymium (Nd2O3) and Praseodymium (Pr2O3). DDH 18RE-1, 5, 6, 8, 9, & 14 contain 2.3-7.4 meter wide phyric textured pegmatite sills that are spatially associated with adjacent Nb/REE bearing carbonatite. 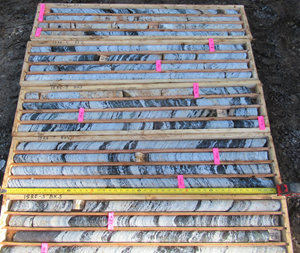 The pegmatite sills contain low grade Nb and REE values and cut the Nb/REE bearing carbonatite. The distribution of Nb and REE will be evaluated by generating preliminary computer-generated, 43-101 compliant resource estimates. Future drilling in the area of DDH 18RE-8, 9, 11, 12, & 13 is planned in order to assess the vertical and lateral extent of the wider and higher-grade intervals. Field reconnaissance was conducted by the Company’s N.I. 43-101 Qualified Person Andris Kikauka. Rock chip samples were collected and submitted to ALS Minerals in North Vancouver, British Columbia for chemical analysis using XRF whole rock analysis for oxides. REN lies within the Shuswap Metamorphic Complex, a belt of high-grade and intensely deformed metamorphic and intrusive rocks in the core of the Columbian Orogen in southeastern B.C. The Shuswap Complex, along its eastern margin, is characterized by a series of fault-bounded domal culminations that expose mixed paragneiss, granitic gneiss and migmatite of Paleoproterozoic age. Unconformably overlying the gneissic "core complexes", a heterogeneous and very distinctive assemblage of calc-silicate gneiss, pelitic gneiss, quartzite and marble. The Mount Grace carbonatite, intrusive carbonatites and bodies of synenite gneiss occur within autochthonous paragneiss above the core gneisses of the Frenchman Cap dome. There are two types of carbonatite recognized in the area. Type I, the intrusive phase and Type II, the extrusive phase. Although rarely seen in contact, the Type I carbonatite has been proposed as a feeder to the widespread Type II pyroclastic flow represented by the Mount Grace carbonatite (Hoy, 1987). All regional tantalum, niobium and rare earth occurrences of record are associated with the intrusive Type I phase. The Type II phase rarely if ever carries minerals of economic importance. The Type I carbonatite (known as the REN carbonatite) is located on the Ren property. The carbonatite is a semi-concordant sheet like intrusion and has been traced by mapping and trenching for approximately three kilometers. It varies in width from less than 10 to 200 metres. The carbonatite strikes generally northwest-southeast and dips from 25 to 45 degrees southwest. The rock weathers to a rough textured, mottled orange brown color. It consists of 60-80% calcite, 10-30% apatite, biotite/phlogopite, and accessory amphibole, pyroxene, and sphene with minor pyrrhotite, pyrite, magnetite, ilmenite, molybdenite, chalcopyrite, pyrochlore and monazite. Extensive zones of mafic biotite-rich pyroxene-amphibole fenite and potassic feldspar-albite fenite occur as alteration envelopes peripheral to and within the carbonatite. northwest with axial surface and both limbs dipping 30 to 45 degrees to the southwest. The tabular Type I REN carbonatite is the unit of principal economic interest. In 1988 Teck Explorations Limited completed stream silt sampling (89 samples) from four drainages, 17.85-line kilometers of magnetometer surveying, 15.35-line kilometers of spectrometer/scintillometer surveying and 749 meters of trenching, mapped and sampling. The best niobium values were from trench ATR-2 of 0.19% Nb over a width of 55 meters. Carbonatite that was excavated in all trenches averaged 0.13% Nb. Cerium and lanthanum were all highly anomalous, but the values were not plotted. This data is historic in nature and based on drilling results reported by previous operators. The Company believes this information, reports, data and assays are reliable and relevant. Niobium is mainly used in the form of Ferro-Niobium to produce high strength, low alloy steel which in turn produces lighter, stronger steel for use in the automotive, structural and pipeline industries. The U.S. imports 100% of its niobium needs. Niobium is listed as a strategic metal and is being considered for national stockpiling in the U.S., China, and several European countries.